Am I a Saucy Mama? You bet your kitchen sink, I am. 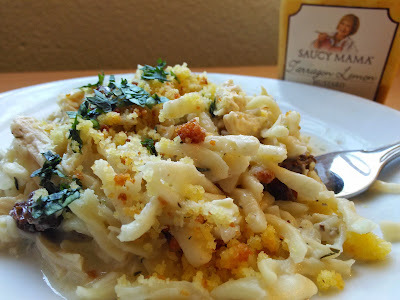 I'm gearing up for competitive cooking once again and I have been selected to join an excellent group of bloggers to enter the Saucy Mama's 2015 Recipe Contest to compete at the World Food Championships to vie for bragging rights, some money and a trip to the new home of the WFC, Kissimmee, Florida! In 2014, Saucy Mama really came through and helped me at the WFC in Las Vegas. A crucial component to my White Cheddar & Chive Biscuits with Pepper Jelly was (and still is) Saucy Mama's Honey Mustard Dressing. Not only did they agree to ship it to my hotel, it didn't arrive in time for me to compete and they were able to procure a bottle of the liquid gold dressing so I could go on to culinary excellence. If that doesn't make me a Saucy Mama, then I don't know what would! I competed in the Recipe division and I am currently 15th in the world. I hope to make it to place in a higher berth in 2015 with this recipe. 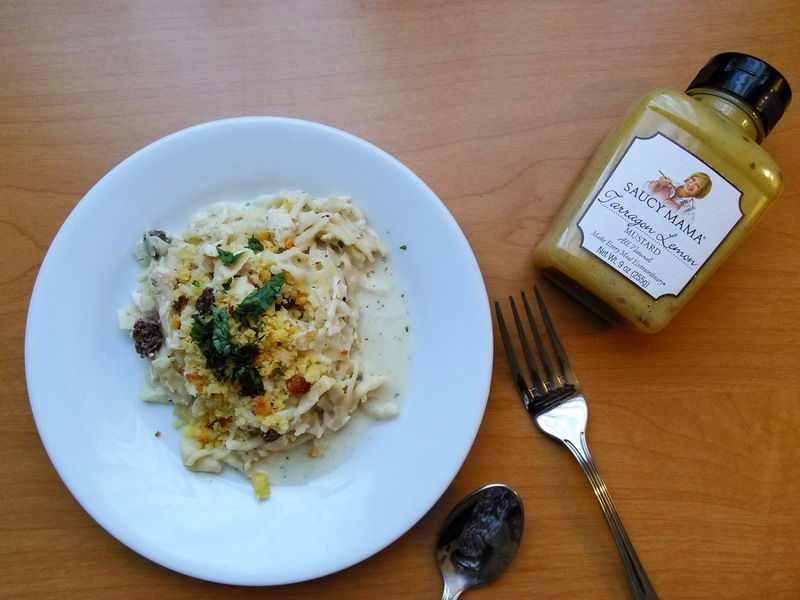 We bloggers were challenged to create a recipe that are easy to recreate, great for families and/or parties that are delicious and inventive--using one of nearly 30 mustards, marinades, sauces and dressings. I chose the Tarragon Lemon Mustard. I chose to make pasta because it truly is an easy thing to make, especially when all hands are on deck and everyone in the family can help with the steps. Making pasta by hand is one of the easiest things to do. Basically, you put everything in a bowl, mix it up, knead it, let it rest and then cut it. 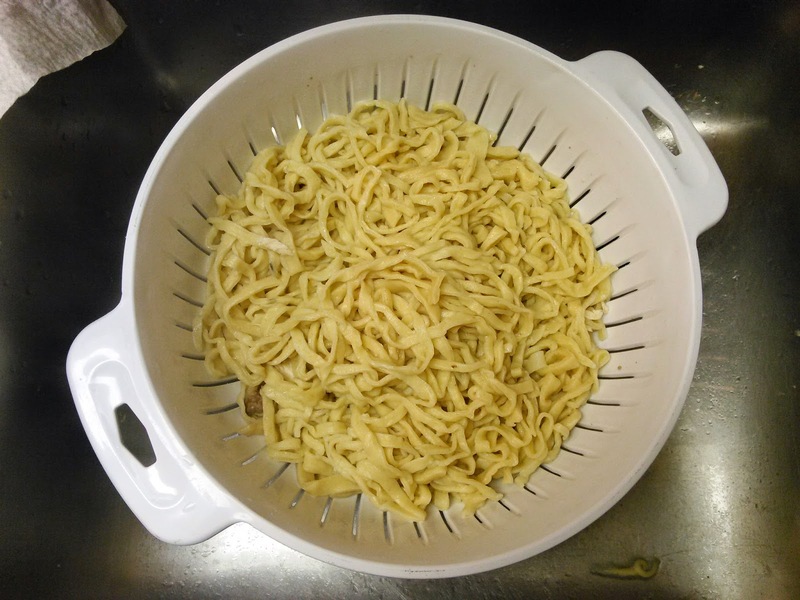 If you're using a pasta machine, it becomes automated and you get to skip a couple of steps. 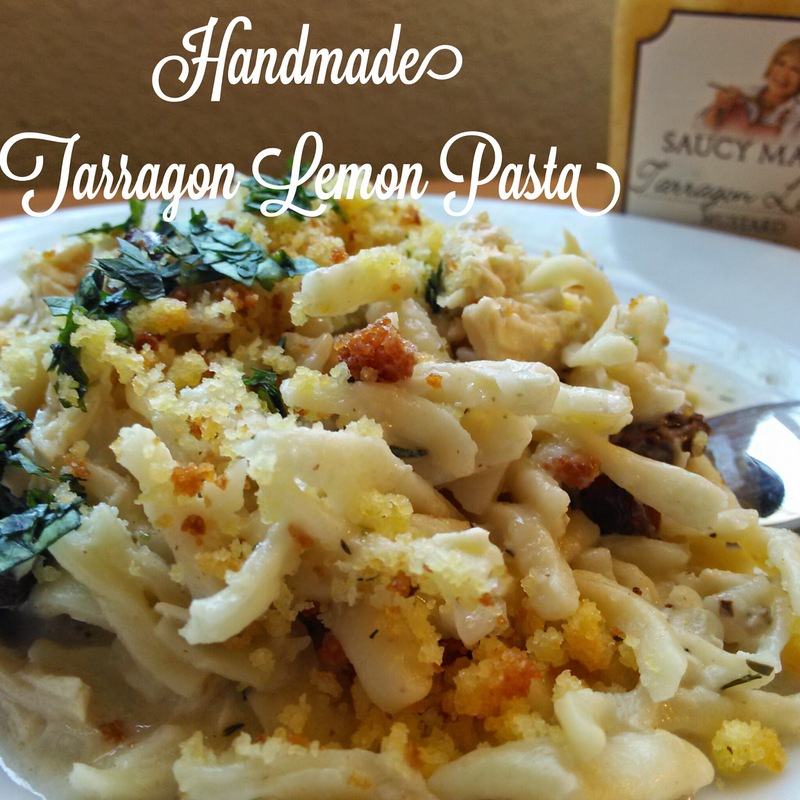 The tarragon lemon sauce comes together so easily, that by the time you've put the the fresh pasta in the salted, boiling water, you're practically done. I top this recipe with lemon cornbread crumbs and mix in seedless grapes to give the pasta an unexpected twist. Generally, I use cornbread from Whole Foods (to save time) and there is no reason why you can't do the same. Wish me luck and let me know if you decide to make this pasta. You're going to love it. I promise. Mound the flour in the center of a large wooden cutting board or work surface. Make a well in the middle of the flour, add the eggs. Alternatively, use a large bowl. Use a fork to beat together the eggs, mustard and lemon zest and begin to incorporate the flour starting with the inner rim of the well. As you incorporate the eggs, keep pushing the flour up to retain the well shape (do not worry if it looks messy). The dough will come together in a shaggy mass when about half of the flour is incorporated. If using a bowl, pour the mixture onto your work surface and start kneading. 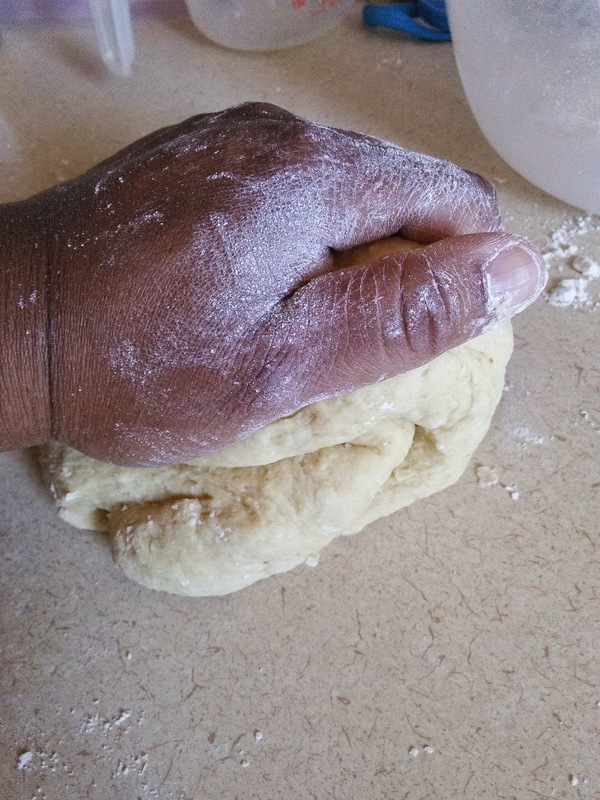 Start kneading the dough with both hands, using the palms of your hands. Add more flour, in 1/2-cup increments, if needed, if the dough is too sticky. Once the dough is a cohesive ball, remove the dough from the board or work surface and discard any leftover dry bits. Lightly flour the board and continue kneading for 3 more minutes. The dough should be elastic and a little sticky. Continue to knead for another 3 minutes, remembering to dust your board with flour when necessary. To test if your dough is ready, cut it in half. You should see very tiny bubbles. The dough itself should be smooth. Wrap the dough in plastic and refrigerate for 30 minutes or let sit at room temperature for the same amount of time, if using right away. Roll and form as desired. In a large stock pot, put on to boil, 4 quarts of heavily salted water. Divide the dough into 5 equal pieces. Set aside 1 piece; rewrap the remaining 4. Dust both sides of the piece with flour, then press the cut side down into a square shape. With a rolling in (or wine bottle), roll the dough into a 6-inch square by rolling from the center of dough ­­­­one way at a time. Continue rolling until the dough is thin, like paper, lifting it frequently to release it from the counter and flipping the dough, dusting both sides again with flour. After you've rolled the dough to your desired thickness, start with the short end, gently fold and roll the pasta sheet to create a flat, rectangular roll. 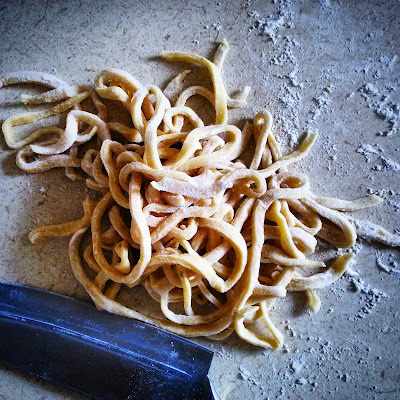 With a sharp knife, cut the dough into even strips, which will become your noodles. Use your fingers to unfurl pasta, then transfer to a floured baking sheet. Repeat with remaining reserved dough pieces. After the pasta has been cut, drop it into the salted boiling water and stir. Fresh pasta cooks very quickly. The pasta will be ready in 2-3 minutes. The only way to know it's done is taste. Drain, set aside. Melt butter with oil in heavy large skillet over medium-high heat. Add shallots to skillet and reduce heat to medium. Sauté until soft, about 3 minutes. Add heavy cream, whisk in mustard and sprinkle in herbs de Provence. Add raisins or currants to skillet. Reduce heat to medium-low and cook, about 2 minutes. Season with salt and pepper. In a small bowl, combine cornbread crumbs and lemon juice. Spoon crumbs onto a prepared baking sheet and put under the broiler in HIGH for 3 minutes. Remove from broiler and let cool. As the crumbs cool, they will crisp up. Combine drained pasta, tarragon lemon sauce and top with breadcrumbs. Serve.